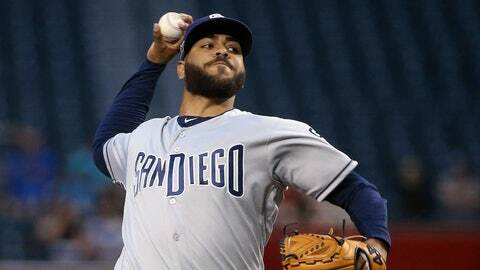 PHOENIX (AP) — The San Diego Padres coughed up a big lead late, costing Pedro Avila a victory in his major league debut. That they managed to win anyway is a testament to how this surprising season has gone so far. Manuel Margot hit a tiebreaking homer in the eighth inning and the Padres bounced back after blowing a five-run cushion to beat the Arizona Diamondbacks 7-6 on Thursday night. Avila was impressive in his debut, scratching through a shaky first inning to allow a run and four hits while striking out five in 5 1/3 innings. Green didn’t want to dig deep into his bullpen, but was forced to after Avila came out. Craig Stammen (1-0) allowed a hit before closing out the seventh inning and Trey Wingenter, giving Kirby Yates a rest, walked two in the ninth before striking out Nick Ahmed for his first career save. The Diamondbacks went 3 for 11 with runners in scoring position and let a chance to win slip away on one pitch out over the plate. The Padres optioned left-hander Robbie Erlin to Class A Lake Elsinore, clearing room for Avila to become the third San Diego pitcher to make his big league debut in the season’s first 14 games. Nick Margevicius and Chris Paddack each debuted against San Francisco. Avila had never made an appearance above Class A before this season and made one start at Double-A Amarillo before being called up. The 22-year-old right-hander got off to a rocky start, giving up three hits and a walk in the opening inning. He escaped by allowing just one run, on Adam Jones’ single, and retired the next 12 batters he faced. Avila was lifted after hitting a batter with a pitch and walking another in the sixth. Godley gave up six runs on six hits and struck out eight in six innings. Padres rookie shortstop Fernando Tatis Jr. showed why he’s such a touted prospect in the second inning, diving up the middle to rob Caleb Joseph of a hit. Tatis also went 2 for 3 with an RBI. Arizona’s pitching staff has at least 10 strikeouts in four consecutive games. … Each of the past four Padres starters making his major league debut — including Jacob Nix last season — has pitched at least five innings and allowed a run or less. … Peralta was 2 for 5 and has 22 hits, a team record through 13 games. The previous mark of 21 was set by Orlando Hudson in 2007. … Reyes has three homers in eight at-bats against Godley and is 4 for 26 against all other Arizona pitchers. Diamondbacks: RHP Taijuan Walker will throw a bullpen Friday in his rehabilitation from Tommy John surgery. Padres: Paddack (0-0, 1.04 ERA) has 11 strikeouts through two big league starts after splitting last season between Class A and Double-A. Diamondbacks: RHP Luke Weaver (0-0, 6.75) will make his third start for Arizona since arriving from St. Louis as part of the Paul Goldschmidt trade. Weaver bounced back from a shaky Diamondbacks debut by allowing three runs in five innings of a 5-4 win over Boston.